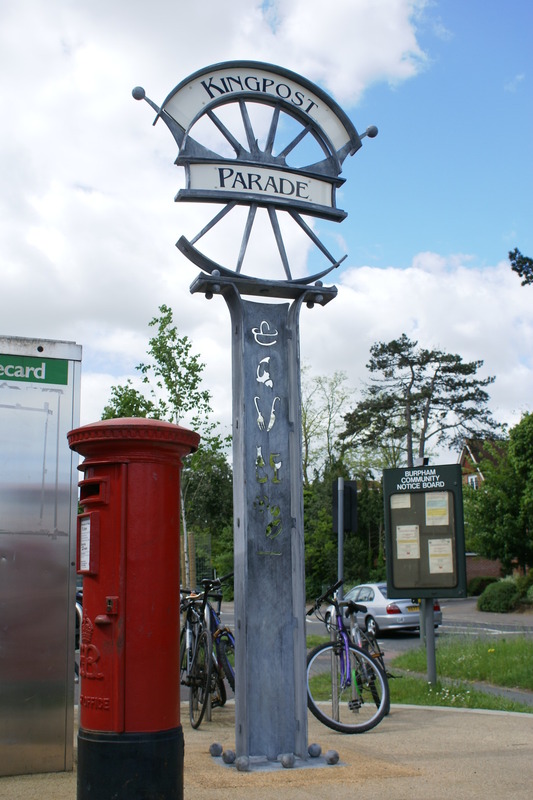 August 2012, Burrows Lea Forge won a design competition for Public Art installation at Kingpost, Burpham, Surrey commissioned by Guildford Borough Council. The site is confined and the Artwork had several jobs to do. It had to incorporate signage, a ‘nod’ to the heritage of the site, the usual public interaction criteria as well as having very low maintenance requirements. Burrows lea Forge rose to the challenge (as usual) and designed it tall and proud with a small footprint. One amendment to the design and the order is placed. We were very busy at the point of order and a long turnaround time had to given, with a promise and guarantee the work would be in place by the end of February 2013. Extracts from my Design and Access Statement describe the work better than I can write here and now: “The proposed Kingpost & London Road parades Public Artwork takes the form of a Signpost, set into the centre of the existing, circular communal area. The Public Artwork is essentially a sign and a post; it has generic iconography on the upper portion of the post that is surmounted by a large two-sided insignia/logo/sign. 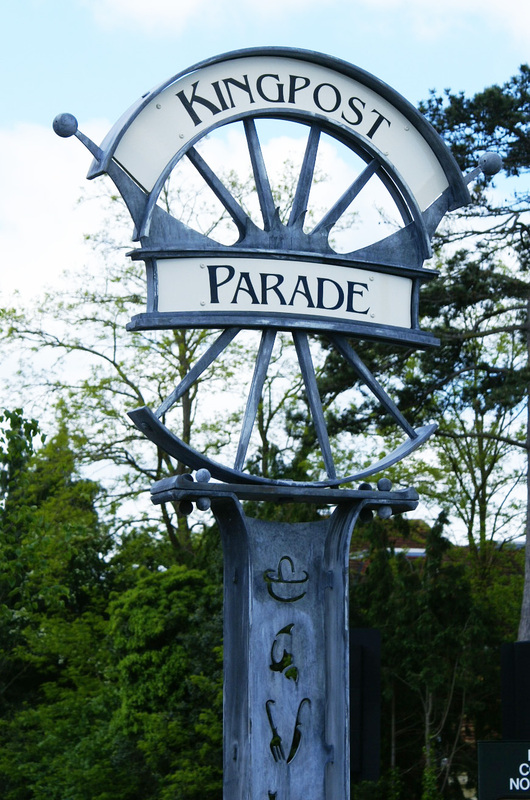 It has integral signboards stating Kingpost Parade on one face and London Road Parade on the other. The sign depicts a stylised ‘meld’ of a Crown (Kingpost) and a Cartwheel (London Road). The wheel sits/rolls on a ‘road’ obstructed by large pebbles (actually the steel ball nuts that hold the post and sign parts together). The design is visually balanced, giving neither the crown nor the wheel dominance; as with the two actual shopping parades. The framing effect of the wheel rim is truncated in the design to offer the signboards more space and get the message across. I consider the site of the Artwork to be ‘walk by’ and ‘seen from a far’, so it has to be tall, over 4 metres in fact, if it were shorter it would just disappear into the shop signs and many road signs that ‘litter’ the proposed site. The post is quite large too, but it needs to be to resist flex caused by gusts of wind and/or revellers who decide to test their climbing skills. The Artwork was installed on a substantial foundation, on time and on budget in February as promised. Thanks to Guildford Borough Council for the commission, to S.R.Newman Ltd. for preparing the foundations/making good and to JPS Ltd for transport and lifting services.